Surrounded by pristine white beaches and coral reefs, Bathala is probably the best dive resort in the Maldives. It offers easy access to many famous reefs or thila, including the protected marine reserves of Maaya Thila and Fish Head. Apart from fabulous corals and the strange creatures that live among them, the list of resident marine species round Bathala includes barracuda, turtles, rays, Napoleon wrasse and several varieties of shark. But you don’t have to be a diver to enjoy Bathala. This remote tropical island getaway is full of serenity and its own uncomplicated charm, ideal for the Robinson Crusoe in you. Bathala is perfect for pure relaxation, a place to lie back in a hammock with a book, watch the moon rise and the sun set, sunbathe, stroll, snorkel or just spend a few quiet, uninterrupted days and nights with someone special. Excursions off Bathala Island Resort include diving excursions, night dives and boat dives. The house reef is wonderful for snorkeling and diving. Guests can easily swim to the reef edge, which drops sharply to about 28m. 35 miles south of Hululle Airport, Malé, Maldives. 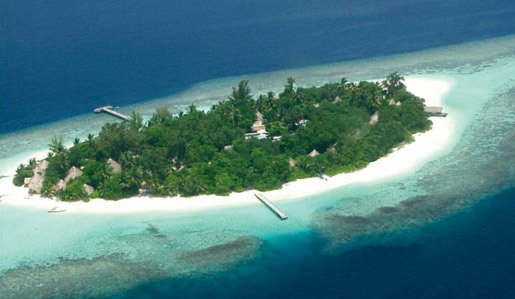 Approximately 20 minutes by seaplane from Malé International Airport. Bathala Island Resort offers accommodation built around a typical diver’s schedule: morning dive, lunch, afternoon dive, relax on the beach, have a beer or two at the bar before dinner and maybe a little music and relaxation afterwards. Facilities are kept simple to suit the pace and character of island life. Highlights include restaurant theme nights, indoor games. For divers and lovers of the undersea world, Bathala remains the finest dive resort in Maldives. Its location on the edge of Ari Atoll makes it the perfect base for exploring the dozens of excellent dive sites nearby. On this tiny island with its Robinson Crusoe atmosphere, a beautiful house reef, populated by hundreds of exotic species from tiny, luminous wrasse and gaudy parrotfish to black-cheeked morays, stingrays and sharks, is just a few steps away from the beach. Gentle currents and clear visibility make the water around the house reef ideal for novice divers. It is also a perfect location for night dives. Further out, but still within easy reach, are a host of excellent dive spots. The main atoll reef, Bathala Thila, offers magnificent corals and is haunted by giant Napoleon wrasse and white-tipped reef shark. It is just a five-minute boat ride from the resort. Also nearby are Maaga Thila, or ‘shark point’ and the famous reefs of Fish Head, where tame Napoleon wrasse welcome divers to their home, and Maaya Thila, with its sharks, eagle rays, turtles, barracuda and stonefish. Still farther away (a two-hour excursion by boat) is Maalhos Thila, a completely unspoilt reef whose corals were not affected by the El NiÃ±o bleaching of 2002. These are just the best-known spots; in all, Bathala boasts 32 nearby dive sites. will find that the instructors at Bathala are kindred spirits, fellow enthusiasts who love both diving and the underwater paradise that is Maldives. Perhaps the best testimonial for Bathala comes from the community of divers that has grown up around the resort, many of whom keep returning year after year. Some of our guests have returned to Bathala as often as 18 times! Distance from resort: Just from the jetty. Features: Bathala Thila is a small thila with nice corals, overhangs and a lot of fish live. White tiped sharkes, Napoleon Wrasses, bat fish, big school of moorish idol, moray eals. – 120 minutes by local Dhoni (close to Velidhu Island resort). – Long small reef with a depth of 18 to 21 meters. – Reef top 18 Meters. – Best – January to April – East current. – A Manta cleaning station. – Nice corals with lots of fish. – At times strong current. – Best : January to April. – Some times strong current. – Divers go from East to West and Mantas come against. – This is also a point for Manta’s between 4 – 10 who come close until 1 meter. – Generally this dive is on a full day trip. – 10 minutes by local Dhoni. – Good for diving between October and April. – Very often strong current. – Special to Maaga Thila : Grey Shark, White tip Shark, Napolean, Tuna, Sting ray and Barakuda. – Best Depth : 21 – 25 meters / Reef top 18 meters. – 45 minutes by local Dhoni. – Small-could be circled in 30 minutes. – Good for beginners and advanced courses. – Lots of fish to be seen. – Special to Maya Thila : Grey Shark, Barakuda, Eagle ray, Turtles, Octopus, and Stone Fish. – Also special for night dives. The Dive Centre at Bathala is fully equipped and staffed by highly experienced, expert instructors speaking English, German and Italian. Courses are offered with both PADI and CMAS certification. Bathala is the place for those who want to learn to dive the right way. The instruction and pre-dive preparations are thorough, with fuller and more comprehensive briefings for divers. Instruction is also personalised, with 9-lesson courses conducted for groups of no more than three divers at a time. Each course lasts 5-7 days and consists of 8 or 9 dives, theory, full equipment and certificate. At Bathala, protecting the environment we love is a priority. All dives and dive training are conducted with maximum care for the sea, the reefs and the creatures that live in them.